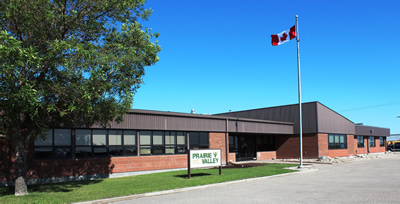 Prairie Valley School Division, established in 2006, is one of 28 school divisions in the province. Prairie Valley spans 27,798 square kilometres from Regina Beach and Bethune to the west, to Kelliher and Lipton to the north, Milestone, Sedley and Montmartre to the south and Whitewood and Kennedy-Langbank to the east. The Division has 39 schools, approximately 8,100 students and approximately 1,300 staff. Visit the links below for more information about Prairie Valley School Division. Map of Subdivisions - The map shows the whole division and the boundaries of each subdivision. 2014-2015 Community Report - The report is produced annually in early winter and includes the results on the priorities, outcomes and targets released in the Fall 2014-2015 Strategic Plan Update. 2015-2016 Strategic Plan Update and Budget - The report is produced annually in early fall and sets the direction for Prairie Valley School Division as we continue to improve opportunities and success for students, showing the link between the work planned and the funds budgeted to accomplish the work. Audited Financial Statements for the Period Ending August 31, 2015 - The statements report on the financial position and operations of the school division. Supplementary Public Accounts for the Year Ending August 31, 2016 - These provide more detailed information on governance and other spending.